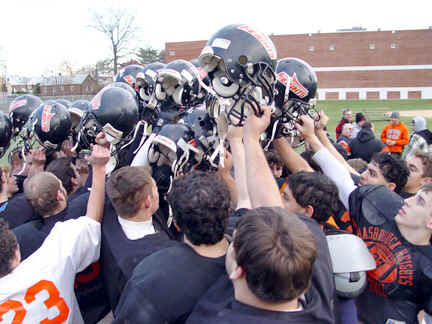 The Aviators Hasbrouck Heights High School Football team started this year with a loss to Ridgefield, went on to win 10 straight games, and then concluded the regular season as Bergen County Olympic League Champs with a chance to play State Finals at Giants Stadium. But the story begins in January 2005 with weight lifting and speed/conditioning camp to improve their personal individual skills. It was about the players personal commitment to the teams success. 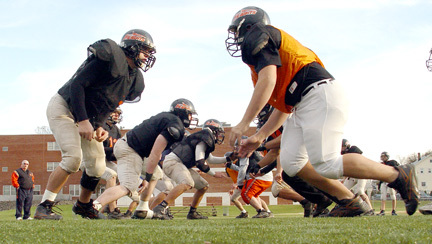 During the summer, several players went to All County Football Camp (speed/conditioning camp) two times a week. After the workouts, the players would go down to the field, throw some balls and run patterns, and work on offense and defense. Players would also work out on their own by lifting weights and running through Hasbrouck Heights streets. There were no vacations or trips down the shore for these players  just football 24/7  living, eating, breathing, drinking, and sleeping football, from the summer training (some of it during 100 degree days),four to five hours a day  with aches and pains and illness  to the final play at Giants Stadium. Some of the players even participated in two sports last winter in order to sharpen their skills for the season. There was definitely a family atmosphere among the team members. Some remembered when, after an exciting win, the entire team ran up to the Franklin Avenue fence to give Luke Ruroede the game ball. Luke had to miss this game because he had chicken pox. The team produced three first team All County players: RB Jeff Seidel, G - Joe Armeli and DE - Anthony Yeswita. First Team Players: RB - Jeff Seidel, C - Brandon Melchior, G - Joe Armeli, TE - Bryan Fill, DE - Anthony Yeswita nd DB - Luke Ruroede. Second Team Players included: QB -Jamie Pasqualone, RB - Dan DAmato, T - Chris Barone, LB - Bobby Calderone and DT - Mike DeSimone. Receiving honorable mention were LB - Brendan Garreffa and G - Jonathan Paige. The players stated that they appreciate the dedication of head coach Nick Delcalzo (who was recognized as Bergen County Coach of the Year), and the coaching staff who worked with the team for the past year, attending clinics, scouting the opposing teams, watching hours of films and inspiring the players. 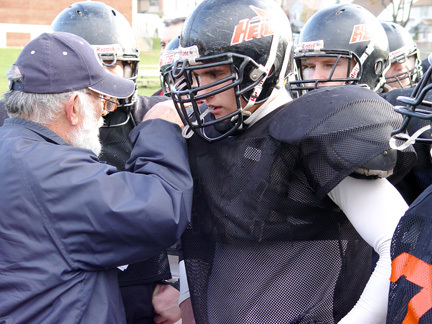 The coaching staff includes: linebacker coach Corey Lange, line coach Mario DAgostino, defensive coordinator Rocco Minichiello, quarterback coach Joey Colangelo, line coach Frank DAmico, offensive coordinator Arnie Perrone, and offensive coach Joe Caruso. 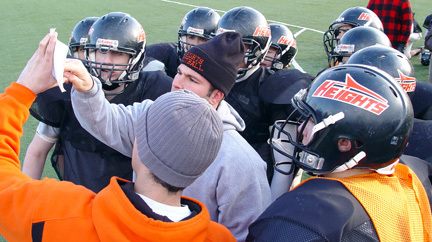 Fundamental to the teams spirit was the support of everybody in the Hasbrouck Heights community throughout the 2005 season.